Though attendance was a bit down for last month's meeting, it was a small-but-keen bunch who met up to talk fountain pens, specifically Esterbrook writing instruments (our primary theme) and newest pen-related acquisitions (our secondary theme). Thirteen members (including newcomer Dana) and one out-of-town guest (Chris T. from the Ottawa Fountain Pen Society) met at the Terry Salman branch of the Vancouver Public Library on February 16th, along with two students from BCIT Radio --- Veronica and Twyla--- who interviewed my pen mentor Brian and I for their radio show (when I get info re: the air date, I'll post it on here). (Standing, from L-R: Chris, Brian, Stanley, Ricardo, me (Maja), Barry K, Bruce and Justin. A quick photo of Chris' new fountain pen--a gorgeous Signum 'Murano'---that he purchased from the Vancouver Pen Shop during his visit. 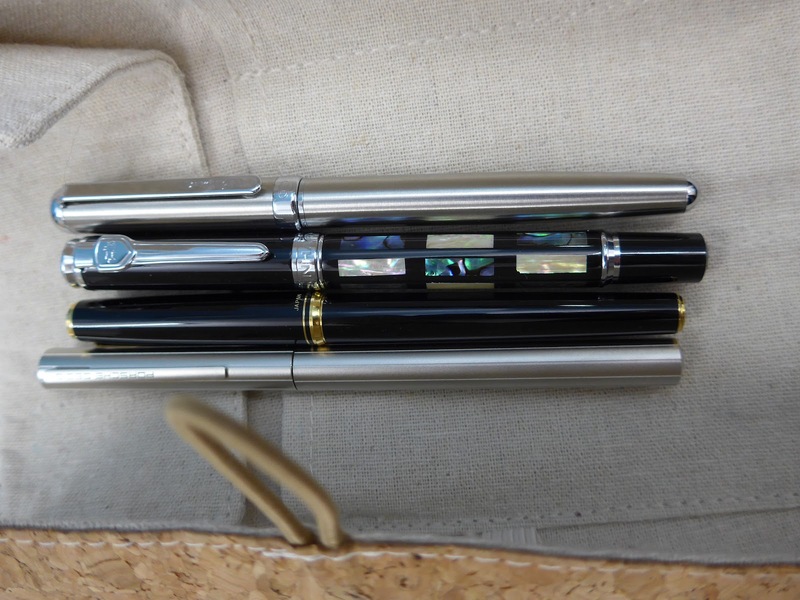 According to their website , this handcrafted, glass-barreled fountain pen was designed by Signum with the assistance of a glass master craftsman from Murano (Venice, Italy). 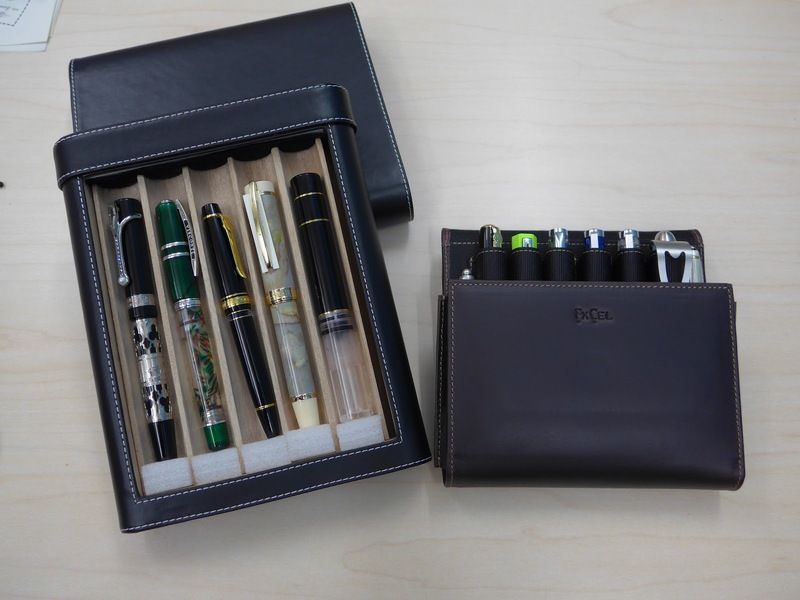 Each pen barrel takes about four hours to create, and involves using different types of glass to achieve the desired colour and effect. 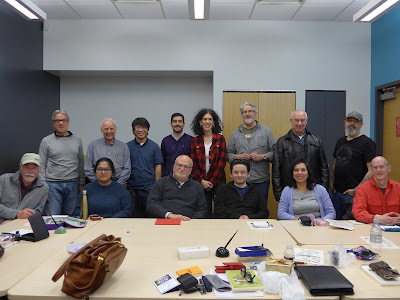 Many thanks to Chris for coming to our meeting again (Chris was at the February 2016 one, as well), and bringing his newest treasure for us to see! One of our newer members (Stanley) brought in some some amazing new acquisitions to show us (from L to R)-- a Visconti Limited Edition (LE) 'Venetia', a Visconti 'Homo Sapiens" LE demonstrator, a Sailor 'Pro Gear II Realo', a Visconti 'Millionaire' LE, and a Visconti Traveling Inkwell. 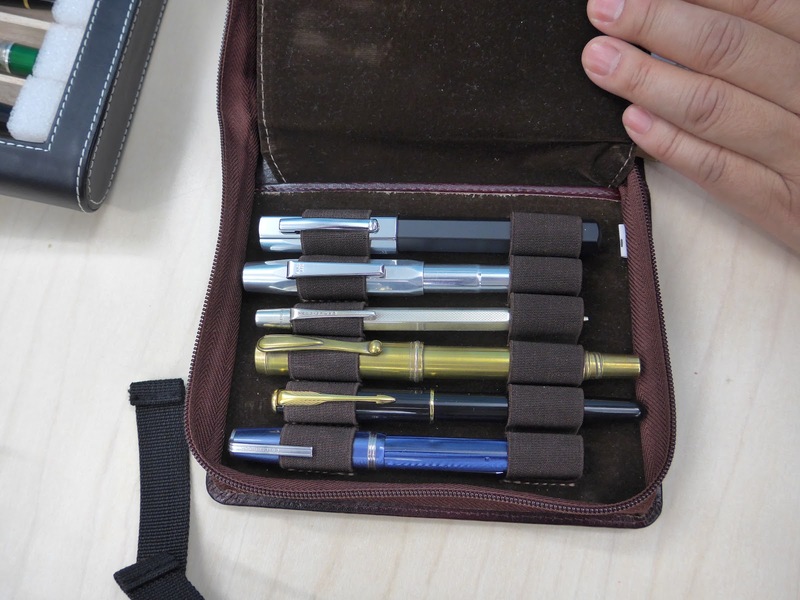 Stanley also brought some other pens in his brown leather Franklin-Christoph Six-Pen 'Penvelope' case. 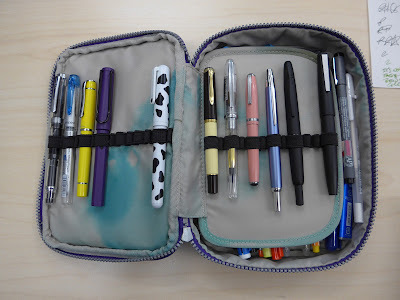 I can't see all of them, but I can definitely see a lime-green TWSBI 'Eco' peeking out! 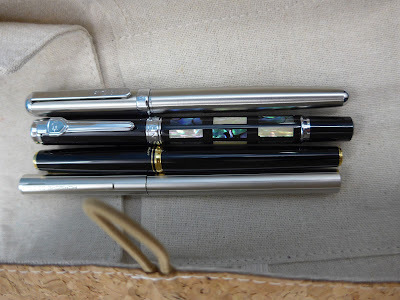 This is a very popular economy-priced fountain pen by a Taiwanese pen company that is known for making well-made, well-designed fountain pens that use piston- and vacuum-filling mechanisms (as opposed to ink cartridges or converters). 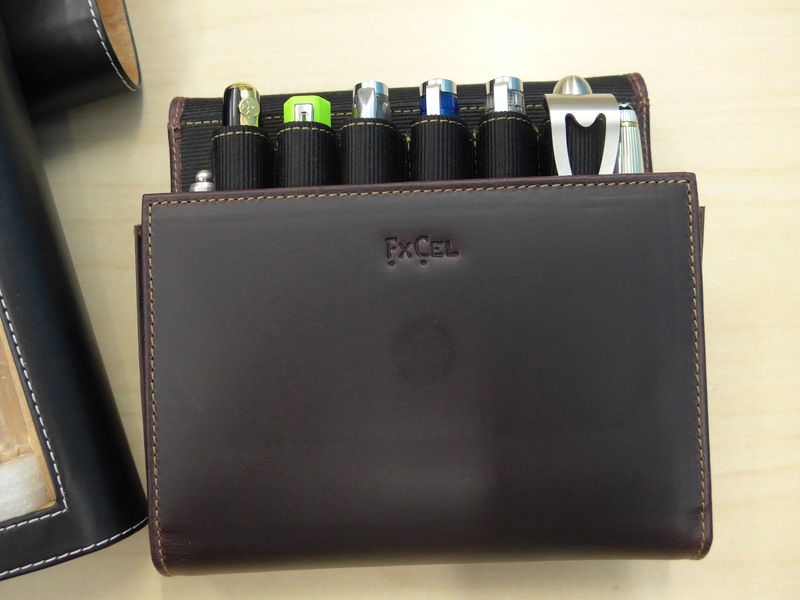 I think this is the fourth 'Eco' I've seen in the last two meetings (and I have one at home :). Speaking of new pens... Jerred brought in a few interesting new acquisitions, including an all-metal Porsche Design Slim Line fountain pen (bottom of photo), a Japanese-made Pilot Seremo model FCM-500R (an amazing value---a fountain pen with a 14K nib for <$70 CAD on Amazon.ca) , a Jinhao '8802' (a beautiful pen I mis-identified as the '1008' model until its owner kindly corrected me :), and an all-metal Diplomat 'Lord' model. 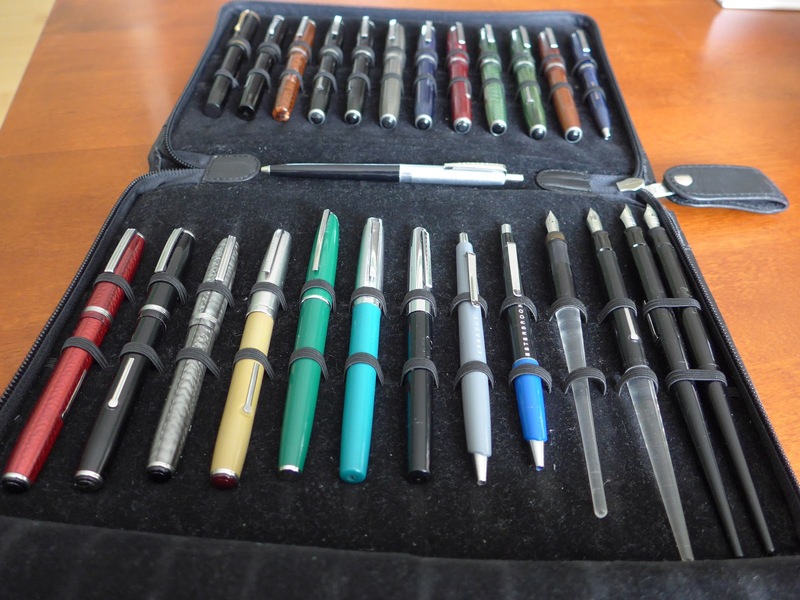 I'm always fascinated by the large variety of styles of fountain pens that our members own. 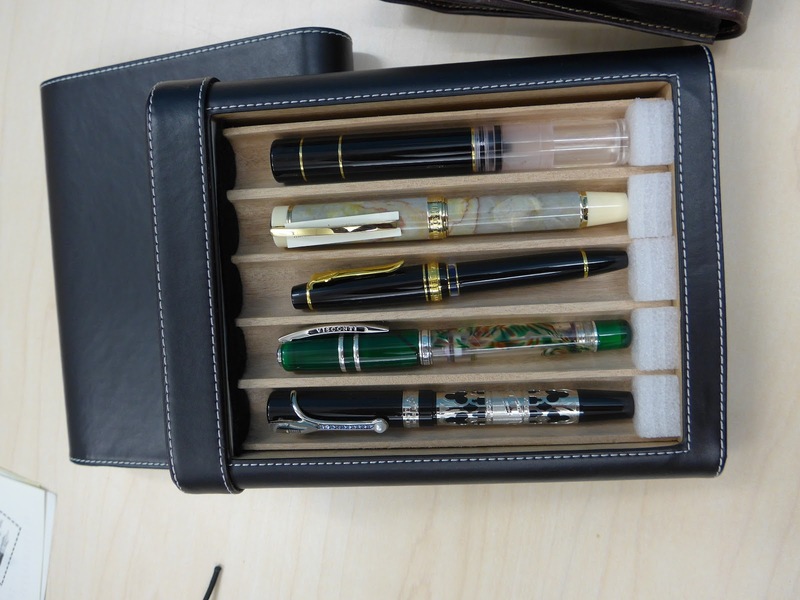 Pictured below are the pens Dana brought to the meeting (from L to R): Wing Sung '698', Platinum 'Preppy', Pilot 'Prera', Lamy 'Safari', Sailor 'Clear Candy', Pelikan M200 Café Crème (Special Edition), Platinum 'Cool', vintage Esterbrook 'CH' (aka "purse pen"), Pilot 'Decimo', Pilot 'Vanishing Point', and Lamy '2000'. 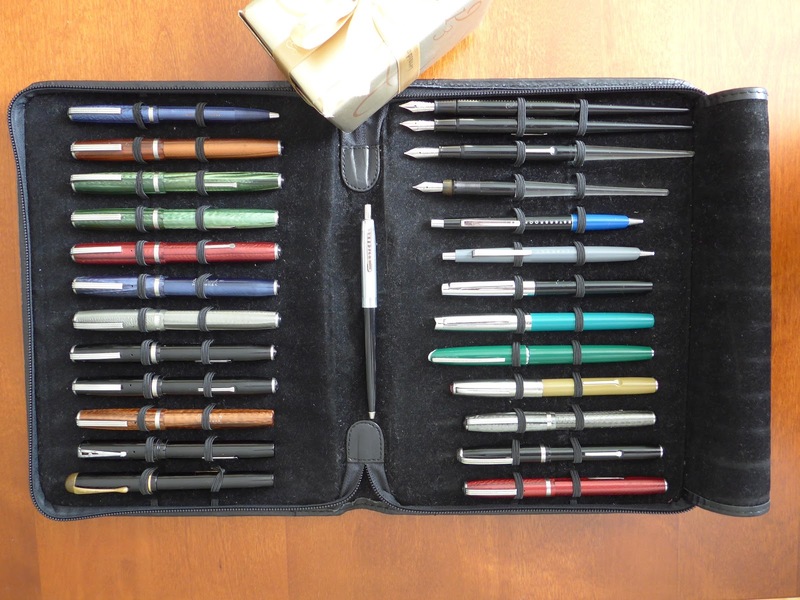 Finally, a quick shot of my Esterbrook writing instruments. The left side of the pen case has my colourful Esterbrook J, SJ and LJ model fountain pens and a blue ballpoint, as well as an early Esterbrook 'Relief' 2-L pen in black hard rubber with 14K nib (made in England by Conway Stewart for Esterbrook!) 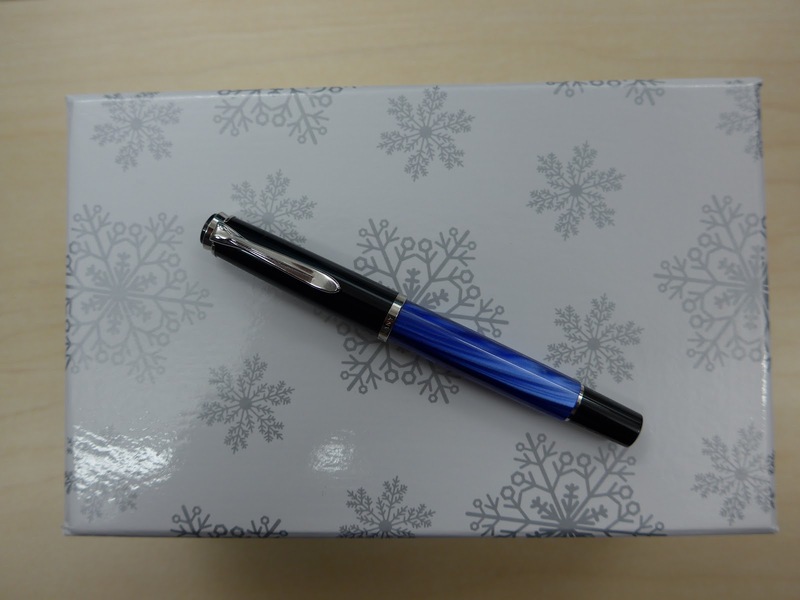 and a black bandless 'Dollar' pen (these two pens are in the lower left hand corner of the photo). 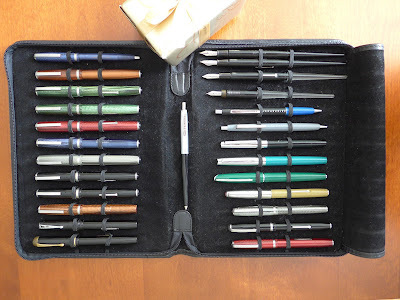 Closer view of the other side of the pen case, showing (L-R) three more pens from the 'J' family, a 'Deluxe' model with tan body (it looks yellow in the photo for some reason) and metal cap, a green 'Safari', an 'M2', a 'CX-100', a couple of 'Scribe' ballpoints and an assortment of Esterbrook desk pens. I missed the very start of the meeting due to my radio interview, but Glenn had brought his new Visconti Wall Street (Chatterley Luxuries Special Edition/Ltd Edition) to show the club. It's a gorgeous pen and I'm sorry I didn't snap a photo of it as well as Justin's new acquisitions---a Pilot Vanishing Point in metallic orange and his new Lamy Al-Star in Pacific. 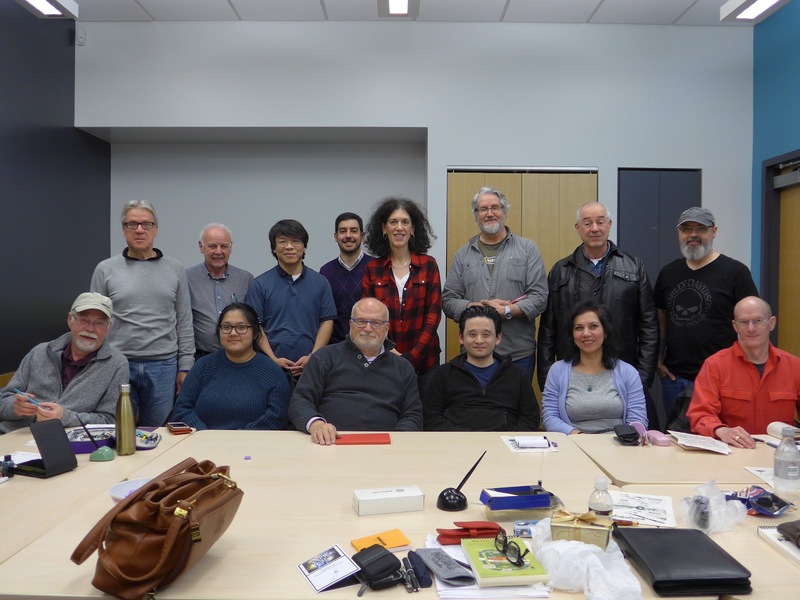 Thanks again to all who came to the February meeting! 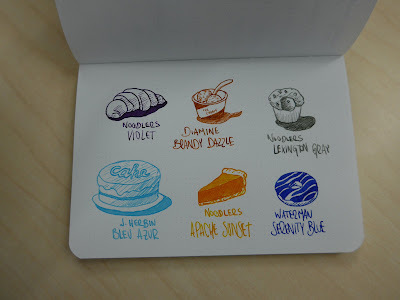 Nice report and photos, thanks. 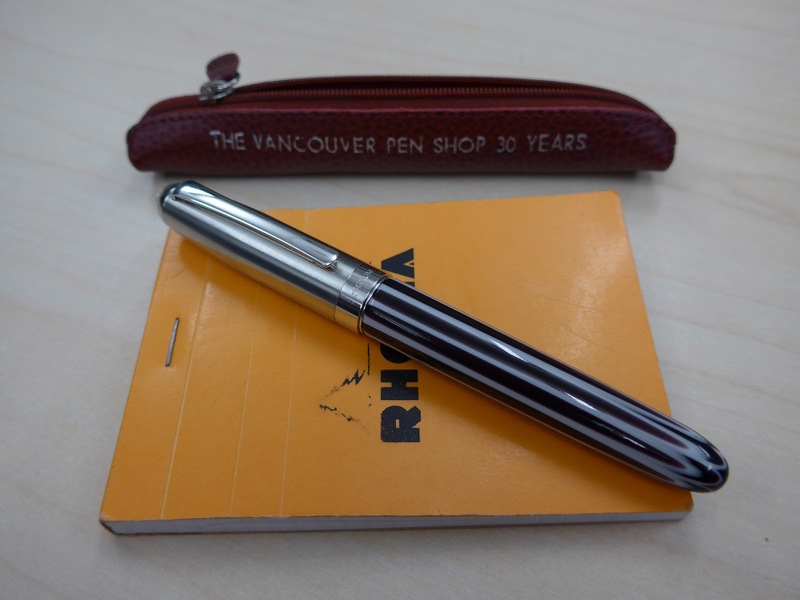 And congratulations on 100 meetings in Vancouver!